Lockette is a long way from contributing in the passing game at the next level, but he is a fierce competitor that could contribute on special teams. He has great size, reliable hands and a knack for getting open on underneath routes in zone coverage. Although he has good deep speed, he is a builder who lacks explosion off the line of scrimmage limiting his ability to separate in man. He also runs sloppy routes and does not show good balance out of his breaks. Lockette has a great attitude and potential, which makes him a late-round option. Lockette is big with long arms. Finds soft spots in zone coverage and possesses strong hands and the body control to make grabs away from his frame. Good leaper that high points the ball well. Flashes a bit of a wiggle in the open field and is a strong runner after the catch. Does not show explosion off the line or out of his breaks. Will not consistently stretch the field at the next level. Extremely raw route runner that is too high in transition and lacks the ability to set up defenders with head fakes. Will not always find the ball in the air. 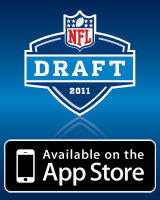 Published: March 8, 2011 at 05:49 p.m.
Watch Fort Valley St. WR Ricardo Lockette perform at the 2011 NFL Scouting Combine. Guidelines: Fan feedback should be within the guidelines for the NFL community. These guidelines will be used to identify those comments that will be removed from display on the site. Please keep your comments relevant to the topic, not abusive or combatant towards other fans, and don’t share any personal details. Use the “Report” link to help keep the community at its best.